So we have learned what Jehovahs Witnesses teach on God & Jesus, now we are going to go through what they teach regarding spirit creatures. A lot of this chapter I would agree with the Watchtower in terms of its teaching regarding the role of Angels and wicked spirits. I even think some of the advice it gives it terms of how to avoid the evil spirits is actually quite good. What is not so good is once again in this Chapter they once again do there best to demise the deity of our Lord. The reason being of course is because they don’t know Jesus, if they did know Jesus they would know the Father as well. (John 14:7). Always be wary when they put words in brackets in their bible. Very often this is due to the fact they want to obscure a bible verse. This is one of those examples. By inserting the word “other” the whole meaning of the verse changes. If you have a Greek interlinear at hand, it could be good to show the JW the error in the translation of this verse. What does it mean that God created things through Jesus? Does this mean that the arch angel Michael has the ability to create? Why do the translators of the new world translation put the word “other” in here? In addition they quote Job 38:4-7, which talks about Angels being “sons of God”. This is to try and support their view that Jesus is also just an Angel. This may seem fair on the surface but remember, that Jesus is God’s “only begotten Son” (John 3:16). Begotten ….not created. Anyway on with the chapter about spirit creatures. The next few paragraphs are under the subtitle of “Angelic support and protection” they use the examples of when an angels closed the mouth of a lion with Daniel and when an Angel was used to help Lots daughters escape from Sodom. Both are good examples of how Angels are used to help people. The only point I would make here is that in paragraph 4, they say angels rejoice when someone “returns to Jehovah” and then quote Luke 15:10 which reads “Thus I tell you, joy arises among the Angels of God over the sinner that repents”. This scripture has nothing to do with someone returning to Jehovah, in the context we can see that actually this talks about how the Angels rejoice when someone repents of their sin when they turn to Jesus for repentance. In addition Paragraph 6 claims that “today we don’t see Angels”. Although I personally have never seen one, I can’t see any bible verse to support that statement. I know that actually many people have seen Angels and as Christians we all have various gifts (1 Corinthians 12:1-11). The next section talks about the evil spirits, and on this occasion I would agree with the teaching. They speak correctly of who Satan is, and they also go into detail about as Christians we should not get involved in the work of the occult. So things Ouija boards, palm reading and fortune telling can be things that are harmful. They even quote Acts 19:19 in the correct context to show that when people where born again at that time they burned their old occult books. I would however just like to put a footnote in here. Jehovahs Witnesses do take this though to the extreme. In their latest DVD release they use an example of a boy called Caleb who has a doll called Sparlock. This doll is by all accounts a make belief Childs toy that has super powers (a little bit like how Sooty had a magic wand and was able to make things appear). Caleb is told to get rid of this toy as Jehovah would not approve of it and Caleb puts it in the garbage. This is why you will often see EX-Jehovahs Witnesses with t-shirts saying “FREE SPARLOCK! !” as a humours way of showing Jehovahs Witnesses how they have taken this issue to the extreme. As a Jehovahs Witness we would not even throw rice at weddings as this originated with people throwing rice to protect the couple from evil spirits. So while I agree with principle they do take it the extreme. How, then, can we strengthen our faith? 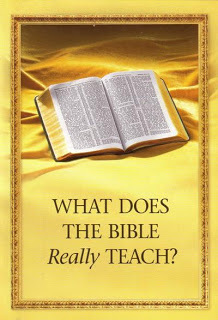 By studying the Bible. The firmness of a wall depends very much on the strength of its foundation. In the same way, the firmness of our faith depends greatly on the strength of its base, which is accurate knowledge of God’s Word, the Bible. If we read and study the Bible daily, our faith will become strong. Like a strong wall, such faith will shield us from the influence of wicked spirits.—1 John 5:5. Amen to that!! But are you studying the bible? Or are you studing a book that is telling you what the bible says? I can assure you I spent much more time reading Watchtower literature as a Jehovahs Witness than I did the bible, and I dare say most Jehovahs Witnesses are the same. The closing statement is “We should not fear these evil spirits”. Again I say amen to that, but why then go to the extreme if we do not fear them? I know when I was a Jehovahs Witness we were told time and time again to not watch Harry Potter as this could damage our relationship with Jehovah. Again I believe that an issue like this should be down to an individual’s conscience and not be dictated to by an organization. So to sum up. Jesus is not just “another sprit creature”, yes Angels are used by God – and no you should not fear the evil spirits, but rather fear the true God.